Don’t the markets just kill ya? The report is weak, BUT the market is flying because…revisions downward last month make the current as-expected numbers look like the economy is improving, but not improving well enough to cause fear of a rate hike by the Fed! WOW! “EXPERTS!” We still remember when economic fundamentals were more important to the markets than government activity speculation! Yes, revisions are back in the news this month. Over the past three months the net jobs added was reduced by 39,000, giving us a three month average 191k net jobs per month. That includes reducing an already dismal 126k estimate from March down to 85k. When we look at just the private sector, which is what we care about, that drops to 189k per month. That won’t cut it. 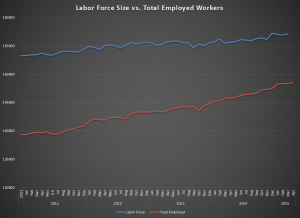 But, as we know, the unemployment rate and the net number of jobs no longer tells us anything about the health of the labor market because the labor force is growing far more slowly than jobs, giving us that artificially low unemployment rate. That trend continues uninterrupted. 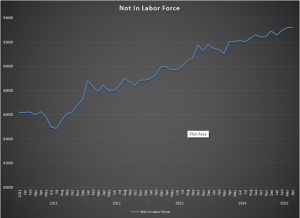 The number of those Not in the Labor Force grew, again, and now stands over 93M, a mark we broke in March. Remember, they are not counted as “unemployed” for the rate calculation because they haven’t looked for work recently. Factor them in, and the true unemployment rate is in the 11% neighborhood while the participation rate is still wallowing around “recovery” lows. The work week for the private sector is still flat, but some data in the deep end of the pool is more revealing and consistent with other reports from the past months. Manufacturing weekly hours fell to 40.8, a number not seen since April of 2014, but Overtime Hours in Manufacturing is on a four month slide now down to just 3.2 hours per week. We had to go all the way back to July of 2013 to see a number that weak. Hourly earnings are still uninspiring at 2.3% for the full private sector. Construction is the better at 2.6% for 12 months, and manufacturing lags at 1.7%. 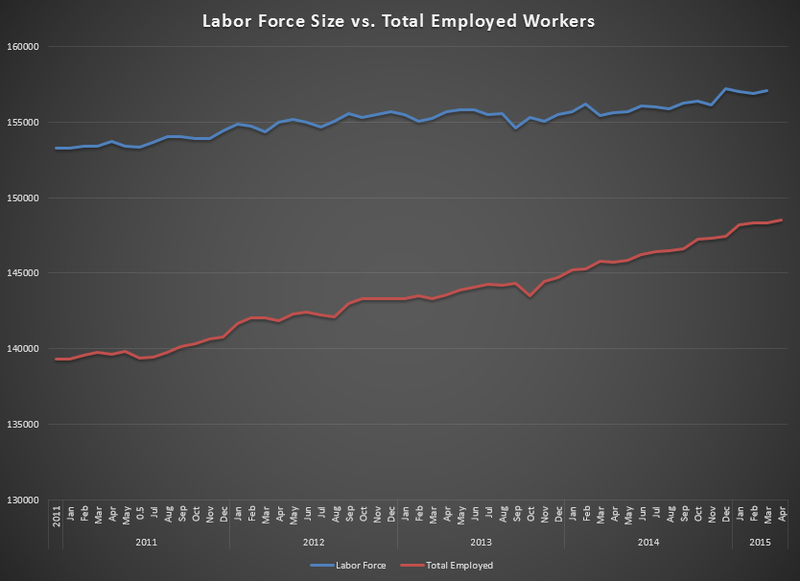 The first graph shows the growth of the labor force relative to jobs growth, and the other shows the growth of those Not in the Labor Force. We could have added the Participation Rate graph, but why pile on? If you’re an “expert” it’s ok to view the report through the prism of paragraph 1. If you invest real money in real business and employ real people, we have no choice but to recommend continued caution, not just due to this report but because of the 40+ reports followed every month by the Blue World Economic Index which remains in negative territory.